Unlike some in the Trump administration, Defense Secretary Jim Mattis believes climate change is real and that it poses a threat to international security, according to a US media report. The nonprofit investigative news website ProPublica ran a story Tuesday that included excerpts of written testimony Mattis gave senators after a January confirmation hearing. "Climate change is impacting stability in areas of the world where our troops are operating today," Mattis reportedly wrote. 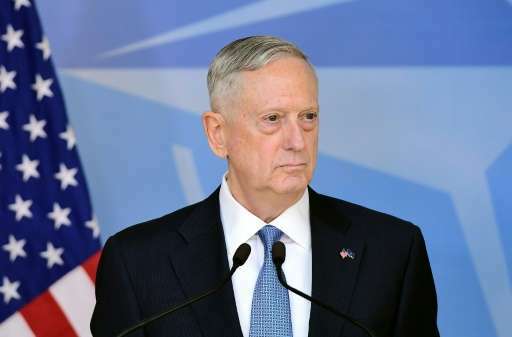 "The effects of a changing climate—such as increased maritime access to the Arctic, rising sea levels, desertification, among others—impact our security situation," Mattis added. Drought and famine are phenomena that push instability, and some of the most vulnerable countries are in the Middle East and sub-Saharan Africa. President Donald Trump once claimed that climate change is a Chinese hoax and has said he will roll back American environmental regulations aimed at curbing the problem. But he also has said he is "open-minded" on the issue. Bloomberg reported Tuesday that Trump is set to sign an executive order limiting the role that climate change plays in government decisions, citing an unnamed person familiar with the plan. Bloomberg said the order could come as soon as this week and would affect decisions ranging from appliance standards to pipeline approvals, and would make it easier to extract and burn coal. And Trump's Environmental Protection Agency administrator, Scott Pruitt, sparked outrage when he went against scientific consensus in claiming that rising greenhouse-gas emissions were not a determining factor in climate change. Mattis has repeatedly taken views diverging from Trump. For instance, Mattis pushed back on Trump's support for waterboarding, and encouraged the new Republican president to take a more traditional stance on the NATO defense alliance that Trump had criticized. Mattis has previously said the military needs to slash reliance on fossil fuels and consider using alternative sources of energy where practicable, ProPublica said.